If I was going to be stuck in a snowbank, it might as well have been with this view. It was two pine trees that first caught my eye. Two trees out of thousands, with snow-capped mountains in the distance. This was going to be the first photograph I made after entering Denali National Park in Alaska. I didn't realize it would also be the last photograph of the trip. I suppose before I go any further I should say that I wasn't seriously hurt when my leg broke through the snow and it dropped two and a half feet, although it was serious enough that I did visit urgent care the next day. I want to also say that at the time it was a laughing matter and I'm thankful that a co-worker who joined me during my scouting trip had the presence of mind to capture some photos on her cell phone. However, that I had someone with me at all, was a rarity and why I've decided to write this post. I've written often about how when I get an opportunity to travel to a great location, I always try and build in extra days so that I can explore the area fully and make some personal photographs. I was laughing at the absurdity of being stuck in a snow bank only three feet from the road and ten feet from my car. That was the case on this assignment to photograph the Department of the Navy's Historically Black Colleges and Universities/Minority Institution program office's historic visit to the University of Alaska Fairbanks. 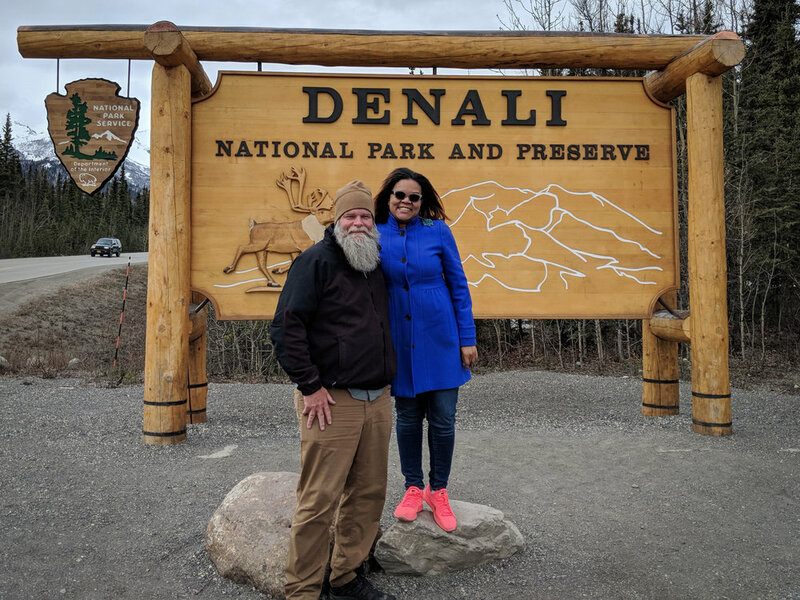 When the assignment came in, I was determined that when it was over, I would visit Denali National Park, only 124 miles south. During a previous visit to Fairbanks* to photograph research on marginal ice zones over the Arctic Circle, my plans to visit Denali were changed when the C-130 aircraft I was in was diverted to Kodiak** on the last day. So this trip was finally going to give me that chance. But this isn't a blog about making epic photographs, it's about how in almost all cases during these trips, I'm alone. Whether it is photographing the coastline in Oregon following an assignment in Portland, or climbing giant rocks in Joshua Tree National Park after several days filming at Camp Pendleton, I've never given much thought to the fact that I'm by myself in these remote locations. Often scrambling down steep embankments or climbing trails and crossing streams, in the dark, just to capture the sunrise. To be safe and satisfy friends and loved ones, I visited urgent care Saturday morning for an x-ray on my lower leg. Results showed no break. Injuring my leg has me thinking differently about the risks I've taken in the past. My original plan for the weekend was to borrow some snowshoes at the visitors center and do a series of short hikes. This trip was a chance to become familiar with the park and plan out those weekend hikes. Even though it was late April, the trails and much of the park was still covered in snow. I could see this, yet still, I was only one step off the road when I broke through the snow. It happened quick. Getting to a place in order to make great landscape photographs often means visiting remote locations. Getting off the beaten path. And I know we don't live in bubbles that involve no risk, but that doesn't mean we shouldn't take precautions. Below are just a few I'm thinking about. The only positive thing about not being able to return to Denali over the weekend was that it gave me more time to visit some of the outstanding breweries in Fairbanks, like HooDoo. 1. Always let someone know where you will be. Better yet, let multiple people know. The hotel desk clerk, the park ranger at the visitor center and even friends and family members back home. Set a time you will make contact so that if they don't hear from you, they can alert authorities. If available, sign in (and out) of the trail log. 2. Be aware of the risks involved and understand your limits. It should go without saying that no photograph is worth risking serious injury. The older I get, the less risk I take, but I also have to understand that I can't do everything I used to do. I'm putting on a good face even though my leg was killing me. Thank you to Sophoria for both capturing the photos of me in the snow, but also for being another voice of reason, urging me to visit urgent care, and checking in on me before catching her flight home that night. 3. Don't be afraid to ask others to join you. It can be difficult for non-photographers and photographers to travel together, but having someone along to share the experience or offer a different perspective can enhance the experience. And if you are lucky, they will also understand why you need to stay in one location for an hour waiting for the light to change. Luckily this story ended well even if I didn't get any photographs from Denali. I'll be back and next time, I'll be sure to play it safe. *On my last visit to Fairbanks I didn't make it to Denali, but I did capture the Northern Lights. **And on that diverted flight to Kodiak, I was treated to an aerial view of what was then called Mt McKinley, now Mt. Denali. A lot of patience and a lot of exposures let me keep the branch in focus while still capturing plenty of motion in the cherry blossoms. Fujifilm X-Pro2, 50mm, 1/15 @ f16, ISO 100. Every year I try to make it to downtown Washington, D.C., at least once to photograph the cherry blossoms. Sometimes my schedule aligns with peak bloom, which historically occurs between late March and early April, other years, I simply make the trip with no expectations other than fresh air and exercise. This year one thing was for certain, the first weekend I was free was already past peak bloom, defined as the day 70 percent of the trees have opened their buds. The other thing about the day I choose to photograph was the weather, overcast with intermittent light rain and low temperatures. The day before, however, was perfect. So it goes and as it turned out, the weather worked to my advantage. Again, knowing that it was well past peak bloom, I was pretty much expecting that the blossoms would be on the ground and figured that would be the picture I came away with. What surprised me right away was the number of blossoms that were floating on the surface of the water in the tidal basin. That was something I had not seen before and I knew right away that this was going to be the photograph. 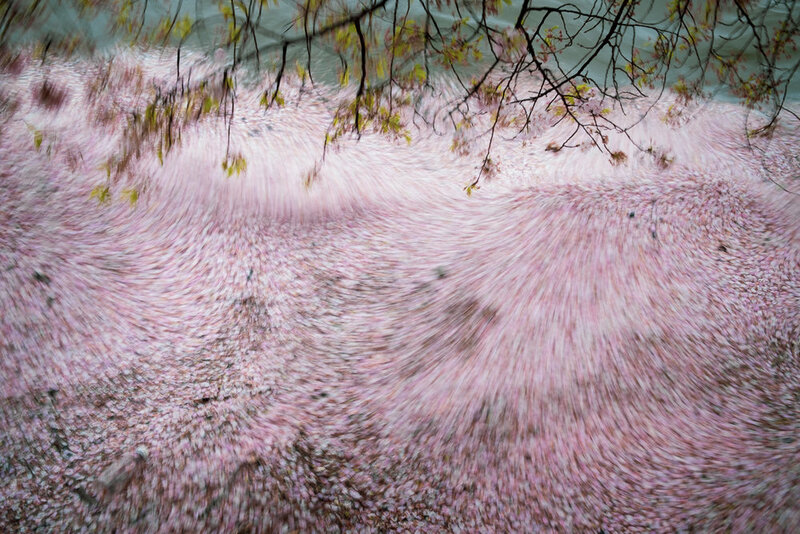 I had a tripod with me, which would allow me to shoot at slower shutter speeds, so It was only a matter of choosing the right shutter speed in order to show motion yet retain enough detail in the cherry blossoms. Too fast of a shutter and I would freeze the blossoms, too slow, and they would be a blur of pink. Even with overcast skies, I knew if I wanted a slower shutter speed, I was going to be right at the limits of my exposure. I stopped my lens all the way down to f16 and set my ISO to 100. That gave me a shutter speed of 1/8th to 1/15th, which I found to be the sweet spot. It's a good thing too, because without a neutral density filter that was it. Sometimes you head out for the day with the intention of making one set of photos and something entirely different presents itself. That was the case on this day and I couldn't be happier with the results. ISN'T THAT THE SECRETARY OF THE NAVY? Secretary of the Navy Richard V. Spencer talks with members of the Office of Naval Research STEM coordination office. Nikon D4S, 24-70mm, 1/160 @ f4.0, ISO 3200. I pride myself on being a prepared photographer. Prepared for an assignment, prepared to make photographs and prepared to move those images when the assignment is complete. That doesn't mean mistakes don't happen or things always go as planned, but again, I like to think that I'm prepared to deal with those instances as well. So perhaps I let my guard down a bit while covering the 5th USA Science & Engineering Festival at the Walter E. Washington Convention Center over the weekend. This event which has over 3000 exhibits and draws in excess of 350,000 people takes place every two years and I've covered all five during my time as the photographer for the Office of Naval Research (ONR). Maybe it was because I was coming off a pretty large job in Panama City, Fla., and looking ahead to the largest maritime exposition in the United States, Sea Air and Space next week followed by an at-sea job at the end of the month, that I was not as focused as I should have been. I got a little later start than I wanted to on Saturday, but still arrived at the convention center around 11:15 and was surprised by how crowded it already was. I made my way to the Department of Defense exhibit space and made contact with those I was supposed to photograph. The booth was a little uninspiring, but those manning it were enthusiastic and were doing their best to engage attendees. Nikon D4S, 70-200mm, 1/160 @ f3.2, ISO 3200. My frustration was that despite a huge convention floor, the booth space I was concentrating on was located in a corner surrounded by other booths, making it bit of a choke point, and making clear shots difficult. For around an hour I tried to get some photos, any photos, of engagement with kids, or kids and parents, who wanted to learn about STEM opportunities with the Naval Research Enterprise but came up short. It was during this time I found myself spending more time talking with friends and only half looking for photo opportunities. I noticed a member the ONR team talking with a casually dressed gentleman, but only lamented the fact that it wasn't a child. Then I noticed several of our team talking with the same person. At that point, I took a look to see if it was perhaps an executive or program officer from ONR. Satisfied that it wasn't, I went back to my conversation. Well, thankfully I was interrupted by someone who pointed out that the gentleman was, in fact, the 76th Secretary of the Navy, completely alone, just taking in the Department of the Navy exhibits. I regrouped and immediately began making photographs, first with a 24-70mm and then switching to my second camera with the 70-200mm mounted to it. A more traditional STEM image. Nikon D4S, 70-200mm, 1/160 @ f 2.8, ISO 3200. Fortunately, the conversation lasted long enough for me to get several usable images. And just like that, I had my photo. Funny thing is that almost as soon as he left, I was able to make two more photos that featured more traditional scenes. I stayed long enough to download and caption all my photos, transmit to DoD sites, upload to ONR's Flickr and Instagram accounts and email to our social media manager for posting to Facebook and Twitter. Just another reminder to never take any assignment for granted and never take it lightly just because you covered it many times before or it's not as high profile as other assignments that are currently on your mind. That's me on the left and my friend Mark on the right, both taken with a Canon Powershot G7. Photo credit goes to each of us respectfully. It was a weekend raft up at Still Pond on the Chesapeake Bay. Two sailboats, one heading north from Annapolis, the other south from North East, Md. At the outset, we all knew it wasn't going to be a great weekend weather-wise, but with busy schedules, you take every opportunity you can to spend time with friends. I'll spare you the details of the weekend in order to protect the innocent, but it was clear when we awoke early Sunday morning and went topside that we should probably forgo breakfast and get underway. 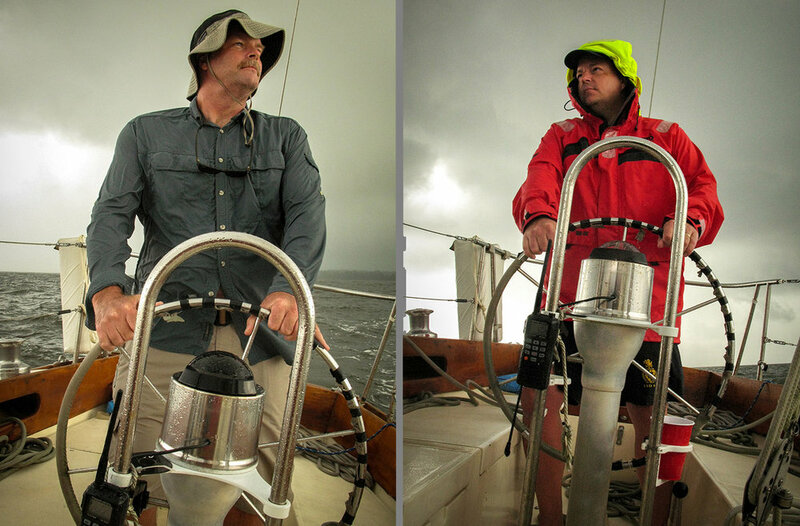 We weighed anchor aboard Valiant, my friend, and fellow photographer Mark's Tartan 34c and slipped out of Still Pond. Almost as soon as we entered the channel and pointed the boat south, the first rain squall hit and the wind picked up. It was clear it was going to be a long wet slog back to Annapolis. However, one thing I did know is that I wanted to make a few photos. With Mark at the helm, I went below and grabbed my Canon Powershot G7, and made a few pictures as the boat heeled hard and the storm clouds continued to gather. After I made a few photos, we switched positions and Mark captured me at the helm doing my best to keep the boat moving in the right direction. I think both images came out great and certainly represent that day on the bay, but I especially like the one Mark made of me because it captures more of the Bay. But this is more about how one of those photos was selected for the April 2018 cover of SpinSheet magazine. The editor of SpinSheet saw the photos on Mark's Facebook page and contacted him about using one as the cover photo. Mark reached out to me and asked if I would mind if he shared them with the magazine, which I didn't. The only question left was which one of us would wind up on the cover and which one of us would receive photo credit. Well by now you know they choose my photo of Mark and according to him, it was due to the red jacket he was wearing. I really think it's because Mark is an Annapolis resident and lifelong sailor, which made him the natural choice regardless of jacket color. April 2018 edition of SpinSheet magazine featuring my photograph of Mark at the helm of Valient. For a quick snapshot, I think the cover looks great and I didn't even realize they flipped the photo until I was writing this blog. Doesn't bother me. But more than the cover or how this photograph ended up there, It started as a great weekend among friends and ended with an epic day of sailing. And with the money I made off this shot, Mark and I will get a chance to relive that day over a few drinks while overlooking the Bay from drier and warmer vantage point. We may even talk about photography and future cover shots.